Since the federal military intervention shootings are up almost fifty percent and deaths from police are up 150 percent. 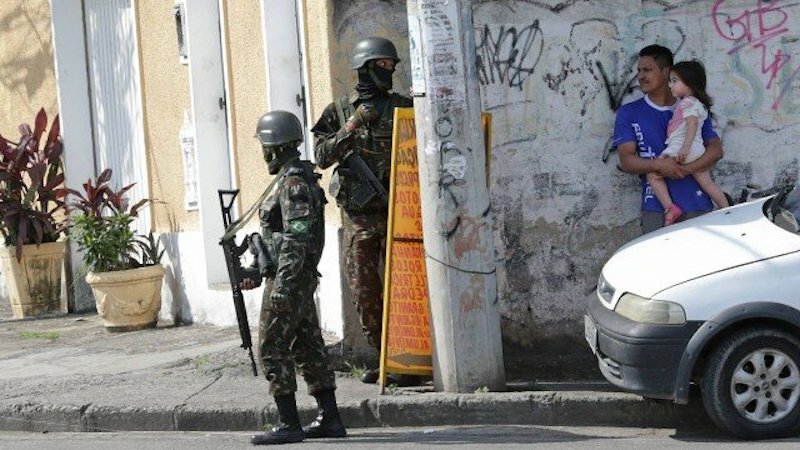 RIO DE JANEIRO, BRAZIL – The well-publicized federal military intervention in Rio de Janeiro reaches its seventh month this week and according to the latest statistics there is little reason to celebrate. Since the federal military intervention shootings are up almost fifty percent and deaths from police are up 150 percent, photo internet recreation. According to the app, Fogo Cruzado, which allows users to report violent incidents to its community database, in the last seven months the app has recorded more than 5,800 gunfights and shootings throughout the Rio de Janeiro metropolitan region. That figure represents an almost fifty percent increase over the same seven month period of 2017 when there were 3,600 incidents reported. Rio de Janeiro city registered the most shootings in the period with 3,454. São Gonçalo was next with 602 and Belford Roxo with 433. Compared to last year, the municipality of Belford Roxo had the highest increase with the number of shootings rising over four hundred percent since the intervention. Another one of the unfortunate hallmarks of the intervention so far has been the disturbing rise of deaths resulting from police operations. Just-released data from the Public Security Institute (ISP) showed that this past August there were 175 deaths from police actions, almost six a day. This is an increase of approximately 150 percent over last August 2017 when there were seventy deaths from police actions recorded. In a recent interview with Globo, Secretary of Security General Richard Nunes suggested that they were looking at ways to reclassify these deaths from police operations as acts of self-defense for the police or military officials involved. This news leaves me very sad. Rio is one of my favorite cities in the world. I was seriously contemplating retiring there. However, because the government thinks it’s better to execute citizens instead of giving them equality, I could never live there. Alas, I may never take a holiday there again either.